August 25th. That was my last blog post. You know how long that was? That is another 16 days that have passed. I suppose a lot but not too much has happened in that time, and so I’ll try to catch you up. See Eleven More Days. After August 25th, I started writing my first set of column assignments for the Everyday Health website. My article assignments were to focus on IBD being a military veteran using the VA and anger issues and management with IBD. I have gone through the first stage of editing and now I have to do the second set and resubmit. Then they will be published, so I’m sure you’ll see those on my social media sites. Yay for new jobs! I wrote my articles for IBD News Today, too, of course. Those columns began a new series and focused on the extra-intestinal manifestations of Crohn’s disease. See Extra-Intestinal Problems, Part One and Crohn’s Disease and Extra-Intestinal Problems, Part 2. The very next day I was called by the VA with information that they were waiting for me to choose a start date immediately. That means I had a false positive on my Quantiferon TB Gold test, my references were on point, and that my background check came back groovy…which I knew it would. If you follow me on social media, then you’ve seen my latest endeavors at the VA. I worked three days this week and I am beyond ecstatic. I make my own schedule, I work when I want to, I leave early when the day gets dull, and every day has been amazing. The people, the patients, I’m so happy to have this job. I mean, I’m there enough, I might as well work there too. I’m officially official. See Facebook and Instagram! That weekend after my job acceptance call, it was labor day weekend. Mine was filled with fantasy football drafts. church, shooting trap and spending time with family and friends. I was super sore from shooting, I need more practice for a repeat shooting day around Thanksgiving. I had only shot trap once before, but I was hitting the clay pigeons okay. I missed a lot, I will say that, and after two rounds I was beaten. I think I hit a significant amount for my second time? On labor day itself, we went to see Kris Bentley and The Revival, again. You know, those bands and people I adore. Singing and dancing and meeting new people, I love the interactions and environment so much. To be honest, I actually saw one of the bands, Grayson Jenkins and the Revolution just last night. And … I’ll see Kris and the Revival with a mixture of artists again tomorrow. I know, I know. I have an obsession with them. But the music is just so damn good. I try to go live and share the joy with people, so you can find all of those online and on YouTube too. Search em. Listen to em. Love em. The day before my first day at the VA, I had my three month follow up with GI. I met with Dr. S, and also her intern who was studying the specialty clinics. I had to share my journey with him, explain my Crohn’s and my battle so far. I talked about my scopes, my surgeries, my medication fails, and my current issues I’m having. Then, he got to share his findings with Dr. S. Perianal and fistulizing small bowel Crohn’s disease, with extra-intestinal manifestations. Yup. We did a physical of sorts, feeling and listening to my stomach. They apply pressure and it is not very comfortable. 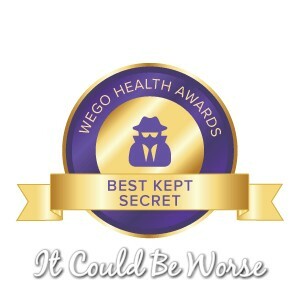 We discussed my migraines and recurring insomnia, waking up at night in pain when I do actually sleep, and the urgency and constant struggle with my bowel. I had lost another pound, I’m still battling with nausea and vomiting and my Crohn’s and stomach have not been friendly lately. I had rectal bleeding the morning of my appointment, I almost brought in a sample for them. So, they put me back on steroids, the ever hated Prednisone. Last time I had this medication, I didn’t feel better immediately like I’d hoped. I tapered myself off when I didn’t have relief, you cannot just stop taking it and there’s a fear of gaining weight and moon face with the steroids. No one really likes taking it but it is a life saver for some. We shall see. I’m to take them for a month and have a repeat visit. Dr. S wanted to see me again and I’ll probably have to get another scope or pill camera. I’m coming up on my year mark since my last scope and it has been even longer since my last camera endoscopy. I’m still wearing my hand brace at random, they alternate in pain. The growth of possible fluid is still present and my toes and thumbs just throb in pain. If the Prednisone helps gout, which you know I suspect I have with the damn joints hurting me and swelling, then fingers crossed it can help me to at least heal something. It can possibly help migraines, too, which is nice since I’ve had a bunch here lately, too. I’ve used almost all my medication for it I even took Advil liquid gels one night and I can guarantee that is why I felt awful the next day. No More NSAIDs! None! The highlight of the past weeks though? I was researching the extra-intestinal manifestations of Crohn’s for my IBD News column, and when I was specifically searching for mouth and oral symptoms, and lo and behold that I see my face while scrolling! How nice it is to see my blog and article images in my own searches! I know I say that I’ll try to be better next week and I’ll try to post consistently, but I think you guys understand. I try to keep up with everything and I’ve even got plans to have a week day off so I can sit and do all my writing assignments and keep up with you all.